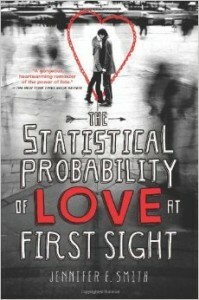 Jennifer E. Smith’s book, The Statistical Probability of Love at First Sight, drew me in on the first page with its heartwarming tale of first loves. For readers who enjoy a great love story, with heartbreak and second chances, this is a book for you. After being four minutes late to her dreadful flight to London, where she would attend her father’s second wedding, Hadley is frustrated and confused. Being stuck at the crowded JFK national airport for three hours does not seem appealing, until she meets an amazing boy in the small waiting area. Hadley discovers that he is British and they will be on the same flight. Soon after, she figures out his name is Oliver and he will even be sitting in the same row as her on the plane. A seven hour flight begins to seem like a seven minute one, even though Hadley has claustrophobia. After Hadley and Oliver are separated at customs, she begins to wonder if she will ever see Oliver again. People who enjoy a great love story that not only portrays teenage love but shows the importance of family and giving second chances, would love this amazing book. The author, Jennifer E. Smith, sure knows how to write a great novel, but the only downside to this was that the beginning of the book was confusing. The author switched from the reality of the situation to a flashback to when Hadley was skiing with her dad, for example, or when her mother met Hadley’s dentist, who soon became her Mom’s boyfriend. I had trouble switching from reality to past, and then back again. Other than this slight confusion, the book was very interesting and amazing. Jennifer E. Smith created an amazing novel about love, heartbreak, and second chances. Taking place over a twenty-four hour period, also in two different countries, this novel really had a place in my heart, and I could not stop thinking about what Hadley was daring to do in order to find her love again. This excellent author also wrote two other books in this category: This is what Happy Looks Like and The Geography of You and Me. I definitely recommend this book and others that Jennifer E. Smith wrote. Thumbs up to this book, I hope you enjoy it!